Squaw Valley - Alpine Meadows is the largest of the Lake Tahoe ski resorts and boasts over 6,000 acres of terrain and over 270 ski trails of which Squaw contributes 3,600 acres (lift served) and 177 ski trails. 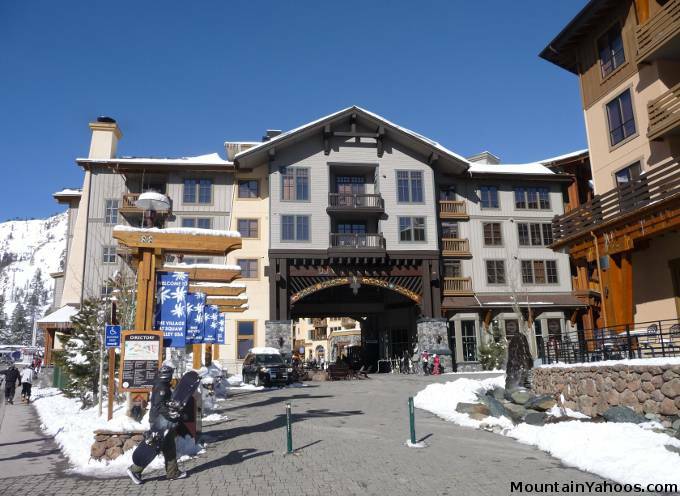 This behemoth is the result of the merging of two separate ski resorts, Squaw Valley and Alpine Meadows on November 2011 but the personalities of the two resorts remain separate. In fact, they still issue two separate trail maps. 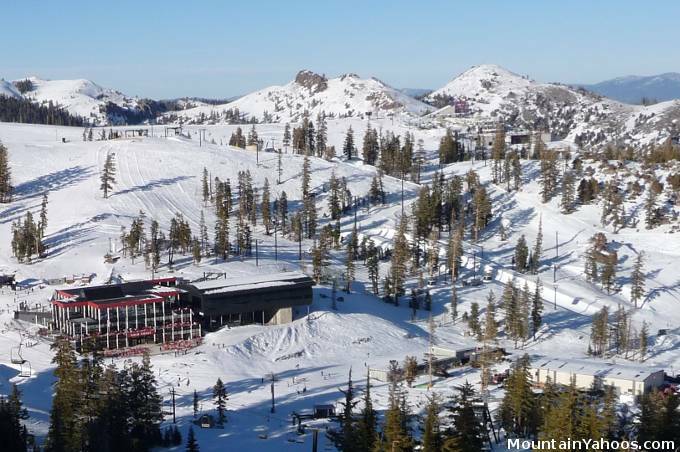 There are plans to integrate the two resorts with lifts to service traversing between the two but so far it maintains the personalities of two separate resorts, with Squaw possessing the more aggressive terrain and Alpine Meadows servicing the intermediate and beginner skiers with some advanced runs at the upper elevations. 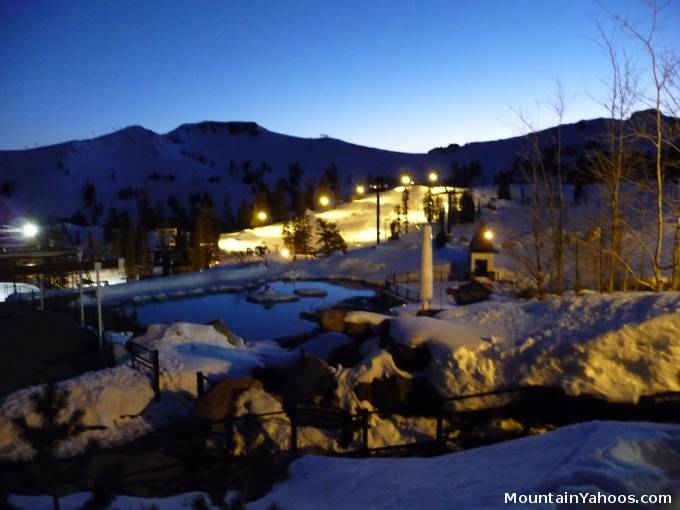 This resort review will cover Squaw Valley only. 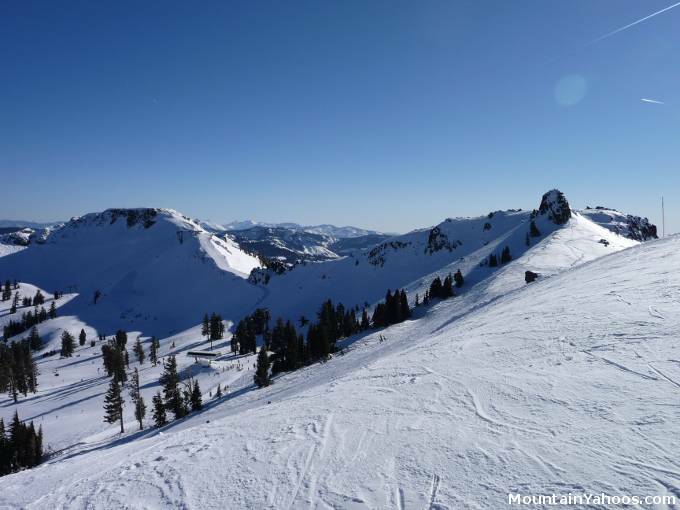 Squaw has six mountain peaks in total, each with its own personality. 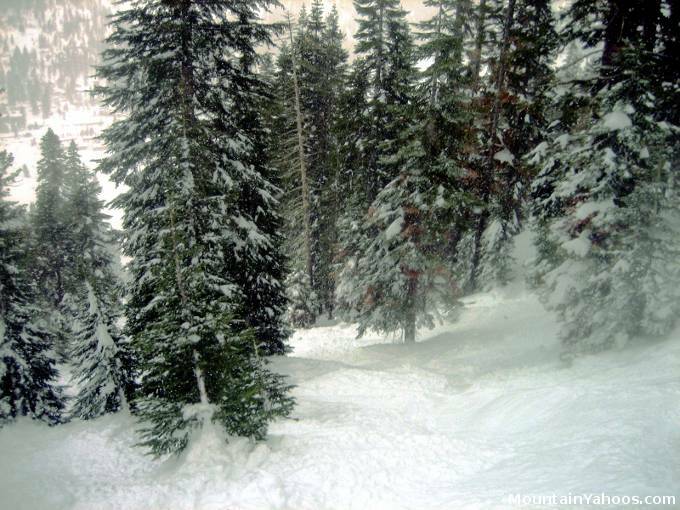 Resorts in the Lake Tahoe area are blessed with large annual snow falls which over the last five years have exceeded 450 inches a year! 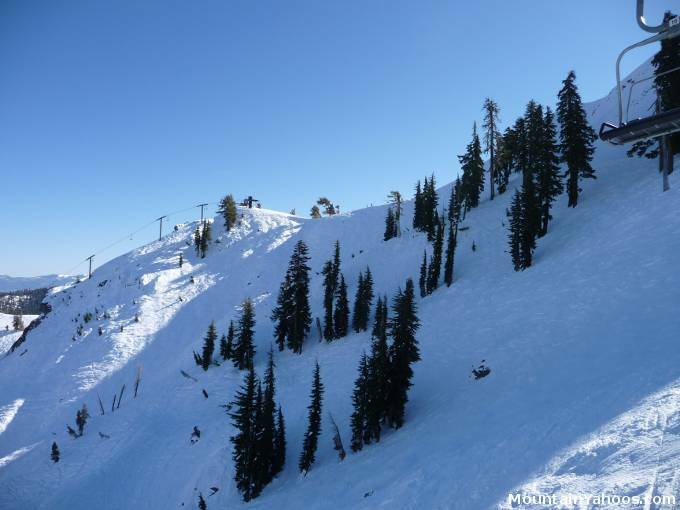 The synergy of a vast terrain and lots of snow make Squaw Valley a popular ski resort destination. There is a main mountain base village at Squaw which launches a gondola, cable car and multiple chair lifts to provide mountain access. The "High Camp" facilities at the top of cable car can be enjoyed by skier and the non-skiing visitor. It hosts an ice rink, poolside cafe, restaurant and bar. Alpine Meadows also has its own base facilities and parking. 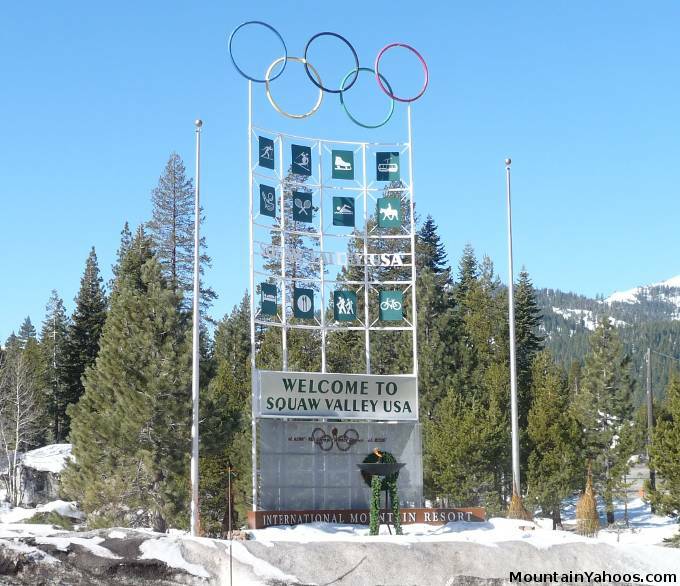 Squaw Valley was also the host of the 1959-1960 Winter Olympic VIII games as advertised by the entrance to the resort. 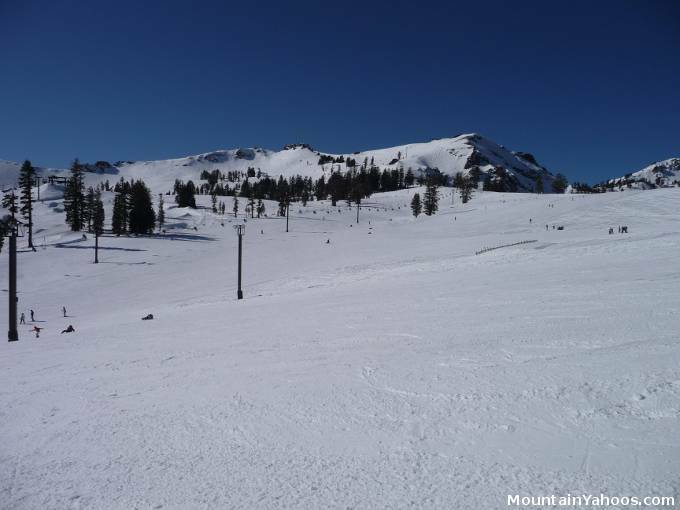 Squaw Valley is know for a vast array of black diamond runs and the snow dumps to enjoy them. These common heavy snowfalls are a double edged sword, they lead to road closures which prevent both the skier and the resort workers from getting to the resort. Don't give up the day as the road crews are effective and when the lifts open, powder pleasures await. 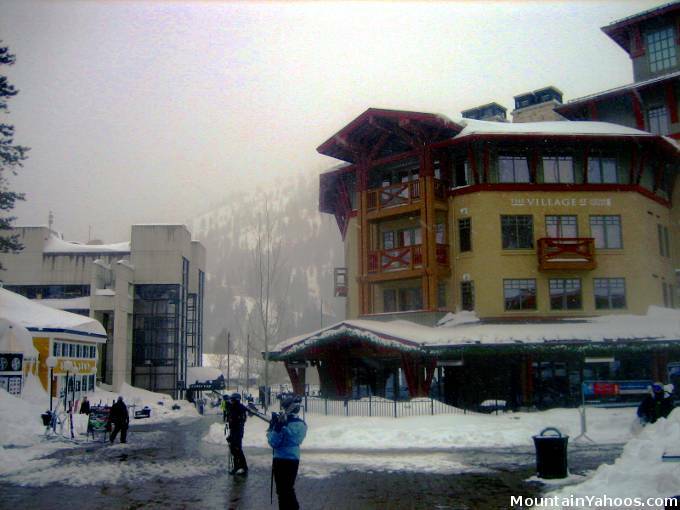 The base of Squaw greets beginners with a short practice "green" run to get acquainted with skiing. The base lifts "Squaw One Express" and "Red Dog" will take you to some intermediate "blue" runs. Once familiar with the lower base runs, the Tram and Gondola provide access to the base of a broader choice of beginner and intermediate runs on the upper part of the mountain. Beginner "green" run: "Links" above the "High Camp" station. Intermediate "blue" run: Top of "Emigrant"
As mentioned earlier, Squaw has a lot of "black diamond" terrain. While Squaw seems to have a reputation for steep runs, I found them all to be comfortably within the skill level of almost any advanced skier. I did not find anything which would require warnings or would be labeled "extreme". The most challenging terrain can be found off of "Red Dog", "Olympic Lady" and "KT-22" lifts. Mosley's run off of KT-22 lift is your best bet. There is limited tree skiing, the best of which I found to be off of "Red Dog" Lift. While "Red Dog" Lift is marked as a "blue" or intermediate ski area, I found that this part of the mountain had more challenging runs than many of the black diamond marked areas. Try it out! 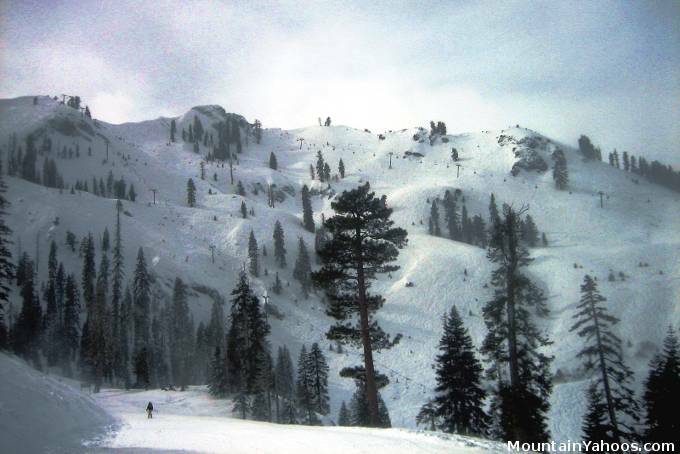 Squaw Valley is surrounded by private land and is "very strict about having closed boundaries", according to resort spokesman Derek Moore (quoted by the LA Times November 1, 2005). Going out of bounds at Squaw can lead to a fine or even having a lift pass revoked for life. Squaw Valley has five terrain parks and with small to large features to support the beginner to advanced rider. The Superpipe is located next to Gold Coast Lodge. 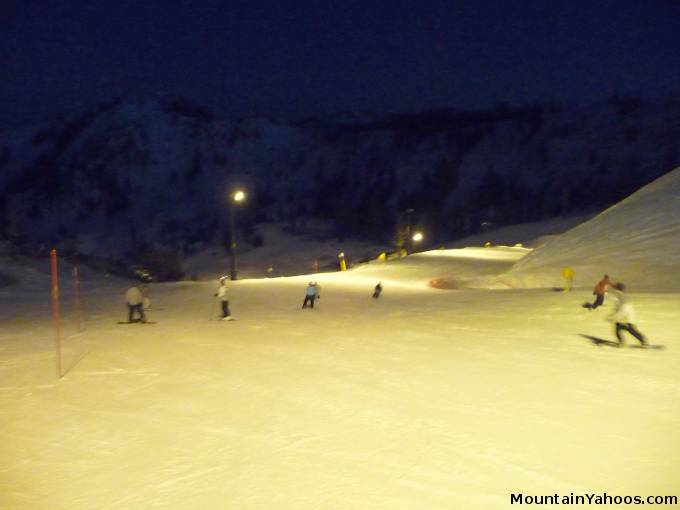 Night skiing is available at Squaw Valley from 4:00 pm till 9:00 pm Friday, Saturday, Sunday and holidays and from 4:00 pm till 7:00 pm Monday to Thursday from mid December till the end of March. This is included with your regular lift ticket. The run from "High Camp" to the base as well as the "Ford Belmont Terrain Park" and "Riviera Superpipe" terrain parks. 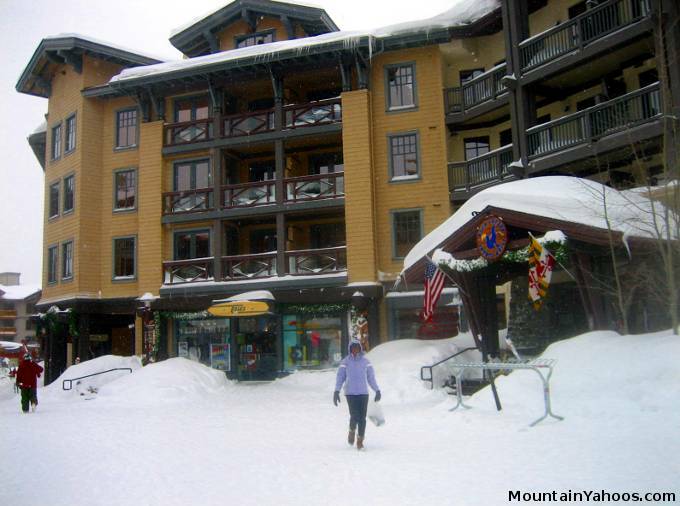 The village at the mountain base of Squaw will supply most needs for those shopping for others or for yourself. There are a plethora of ski and clothing shops as well as restaurants.